Just because some multi-billion dollar carmaker tells you to use only factory-approved replacement parts doesn't mean you can't fix your car with pocket change and some duct tape. Here's what Jalopnik readers have dug up as the ten greatest improvised fixes and modifications in the automotive world. What&apos;s the most MacGyver-like car hack? Why it's brilliant: Carmakers spend billions every year investing in high quality parts and components for their vehicles. Sometimes, a Pringles can and some duct tape will do just fine as a replacement. Why it's brilliant: Just because your fan belt is broken doesn't mean you're going to have to walk all the way to the auto parts store to get a new replacement. A leg of pantyhose will work as well as anything else. It's probably not a good idea to leave the thing on for three months, but it'll keep you from being stuck on the side of the road. Why it's brilliant: Don't have one of those big, fancy tanks that all those NATO guys keep blabbering about? Have no fear! Just weld down some supports to that trusty old Toyota and stick your rocket launchers there. Presto, it's a perfectly jury-rigged mobile missile launcher and it didn't cost you an arm and a leg... until it backfires and blows off your arm and leg. Back in college I was working in Connecticut. My parents had come up to visit and we went down to NYC. Somewhere outside NYC at around midnight my old K-5 Blazer started overheating. Pulled over into a vacant park and ride lot. Realized it was probably a stuck thermostat. Removed the thermostat, but needed something to use as a gasket to get it to seal. Found an orange juice carton in some litter in the parking lot. Cut a gasket out of that and drove it back to my apartment a couple of hours away. Drove it for a couple of days after that before I got a new thermostat with a proper gasket installed. Why it's brilliant: Just because this improvised system is probably ten times more complicated than the A/C that came with the car doesn't mean it's not a genius bit of home engineering. I mean, look at that generator mounted on the trunk; yes it sticks out into the wind like you strapped your grandma to the roof, but it works, and that's what counts. Why it's brilliant: What started out as a bet has become one of the coolest tricks I've ever seen a mechanic pull off. Volkswagens kind of lend themselves to this sort of thing, but it's still amazing. Really though, like any good magic trick, the best explanation for this trick is just to watch. 1-Put the key in ignition and turn it on. 2-Take 1/2 x 30" iron rod and 24 oz. ball peen hammer from under driver's seat. 4-Slide rod through two loops of coat hanger wire mounted to engine until the end of the rod touches the base of the starter. 5- Press and hold the remote starter button mounted to the fender. Wait for a loud click. 6-Whack the end of the rod with the hammer. Starter engages and engine starts. Why it's brilliant: When you do something, do it right. When you're installing a turbocharger setup on your Cavalier, don't just finish it up with whatever parts you have lying around. If you do so, you may end up connecting some very important parts with a PVC pipe from Home Depot. Remember, all the fixes MacGyver put together were only supposed to last until the end of the episode. Why it's brilliant: In what I'm sure was an on-the-spot improvisation, this Chevy driver realize that a missing wheel on a trailer could well be replaced with a tree branch. It's like un-inventing the wheel. Why it's brilliant: A $600 used BMW is not going to be the simplest or cheapest ownership experience, but Jalopnik reader TheReno faced his car's problems with much more resourcefulness than most. 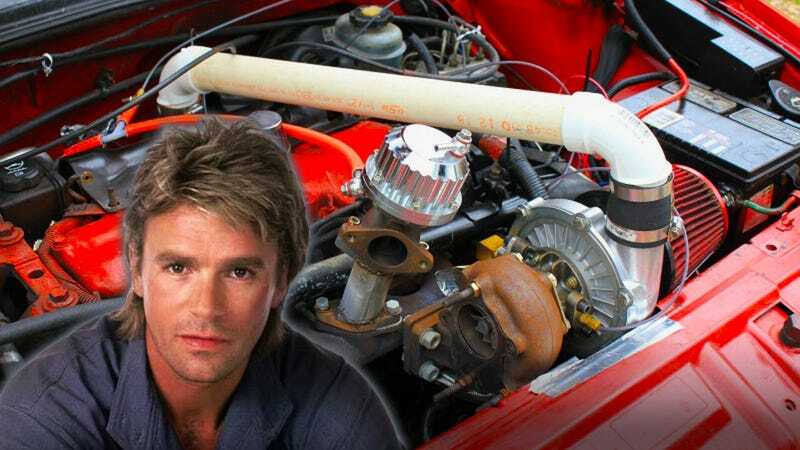 He MacGyver'd his car back to a working state when his car's starter mechanism wasn't working. 2. Use any small semi-bladed item to turn ignition switch which dangled below the column. 3. Use pliers to rotate steering lock 1/4 turn in the clockwise direction, then turn steering wheel to the left and right while wiggling the lock until it "popped" and the steering wheel had free movement. Then it was put into gear and drive. In the first few minutes of driving, if turning the wheel made a clicking noise, the lock was about to re-engage, stop and do step 3 again. If you didn't hear it, or ignored it, you'd end up stuck in the middle of the street with the steering wheel locked during a turn. After about 6 months of this, I had really worn the little nub of the steering lock. It was no longer square, it became a point from being chewed by the pliers. This made turning it more difficult. I needed to either replace the whole locking mechanism and ignition switch, or find a better way to make it unlock. I chose the cheaper route. I took a small stubby nutdriver that I bought at Wal-mart for $0.40, and decided I would weld it to the lock. Sounded like a great plan except for the whole "I don't own a welder" part. I don't own a welder, but I know the principles of Arc welding and I did have a busted lamp sitting in the back seat of the car. The lamp broke while I was moving and never found its way to a dumpster, mostly because the backseat of a $600 car is pretty much the same thing as a dumpster. Wal-mart conveniently has outlets on their lampposts, so, I used my knife, cut the cord off the lamp, separated the two wires and stripped a bit off, wrapped one end on the steering lock. I plugged it in, held the nutdriver on the gnarled nub of the lock, then just squinted and started hitting the part where the nutdriver and nub met with the other end of wire. Bam, successfully tack welded the nutdriver to the steering lock. I played with it to see how fragile it was, and it was surprisingly strong. So, I left it that way. I continued to use it with that nutdriver installed for another 6 months before the car performed a Seppuku, using its own radiator fan to impale the radiator. At that point, it was very clear that this car was going to require a lot more than I wanted to put into it, just to do the daily driving chores. I then removed the nutdriver, and sold the car (with a new steering lock assembly that I bought just before it died), and bought another $600 car. I did tell the guy every single problem with that car, and he went on to fix them all. I see that car once a week as he lives about 3 blocks from me. It's good to see it still running, and not trying to kill its owner.